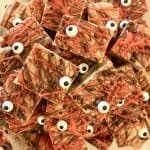 Halloween Cookie Bars – Easy Fun! Halloween Cookie Bars with Chocolate Chips are and easy and fun recipe to make for Halloween. 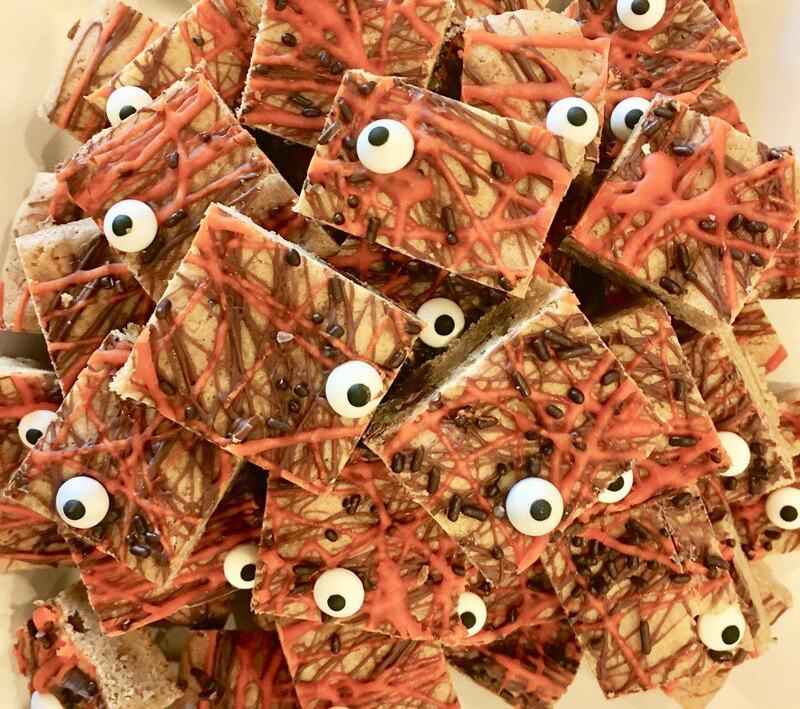 With just a few ingredients, these spooky fun bars come together in no time! Need to put together a quick easy treat this Halloween? 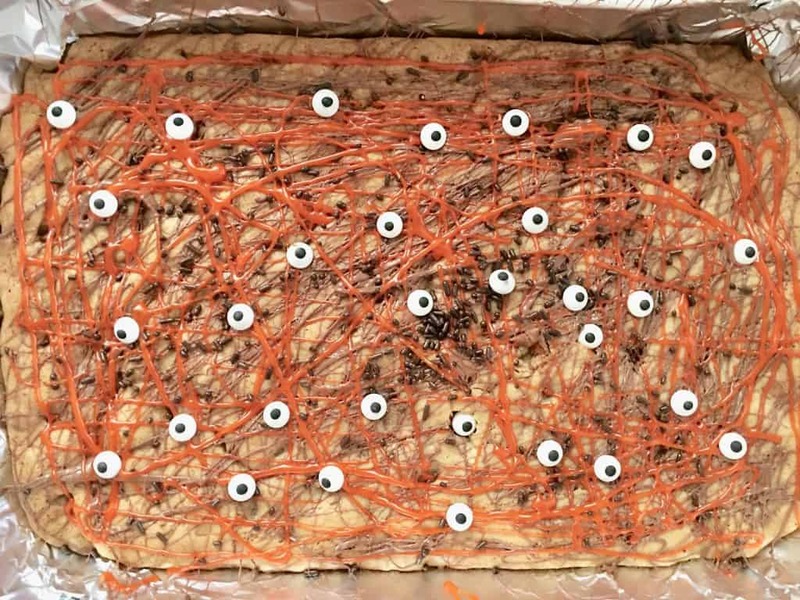 Don’t miss these super easy Halloween Cookie Bars. 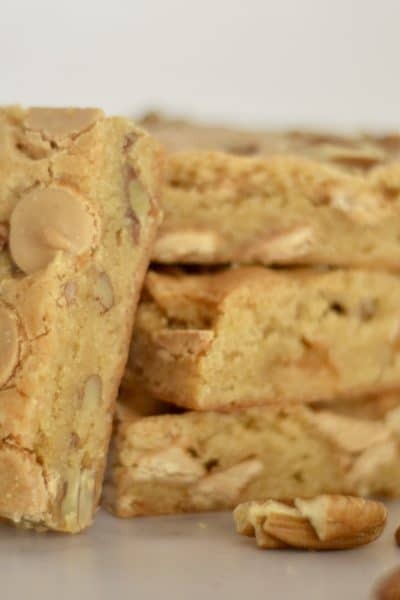 Faster and easier than cookies, this will soon be your go-to recipe for chocolate chip treats. 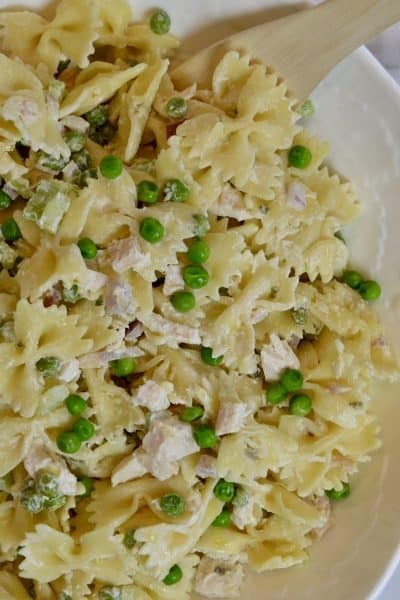 Because time is short, this recipe is a great one to have on hand for every occasion. Perfect for a halloween party or any other time of the year, simply swap out the toppings and frosting colors to customize for your event. Next, make the batter. Melt the butter and stir in the brown sugar, eggs, and vanilla. Add in the flour, baking powder, and salt and stir to combine. Lastly, fold in the chocolate chips and press mixture into prepared baking pan using spatula or damp hands to spread evenly. 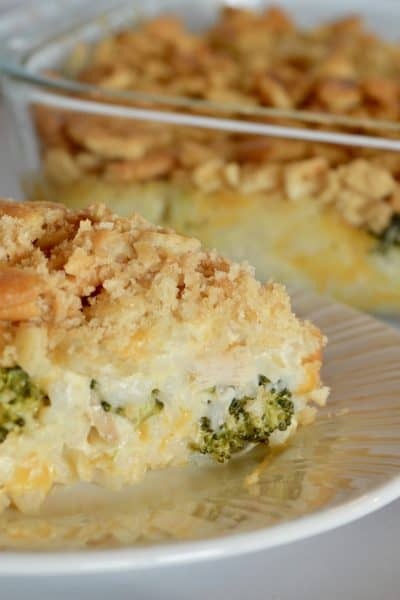 Bake for 30-35 minutes. Cool bars completely. Finally, prepare the topping. 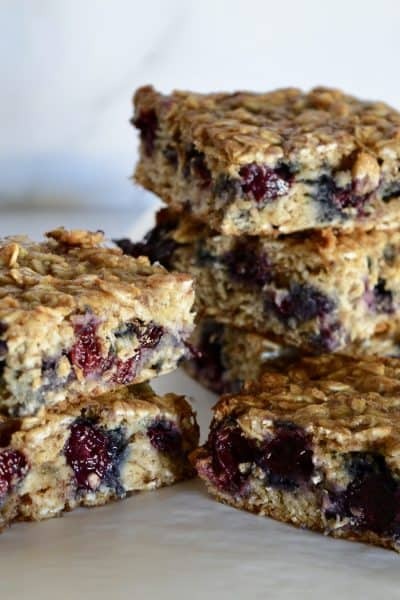 Melt the chocolate chips and drizzle over the top of bars. Drizzle on the orange cookie frosting. 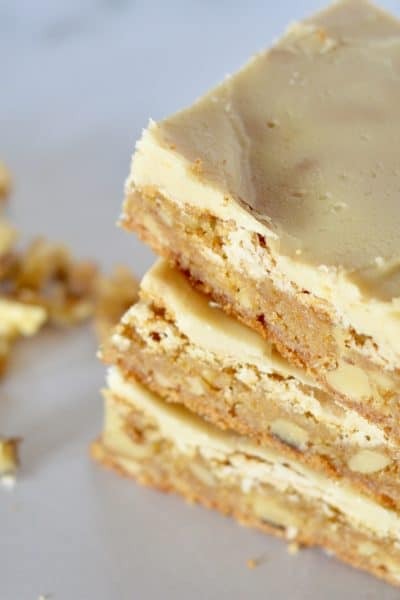 If you don’t have orange cookie frosting, you can substitute melted white chocolate chips and orange food coloring. Before it dries, stick on the candy eyes and sprinkles if using. 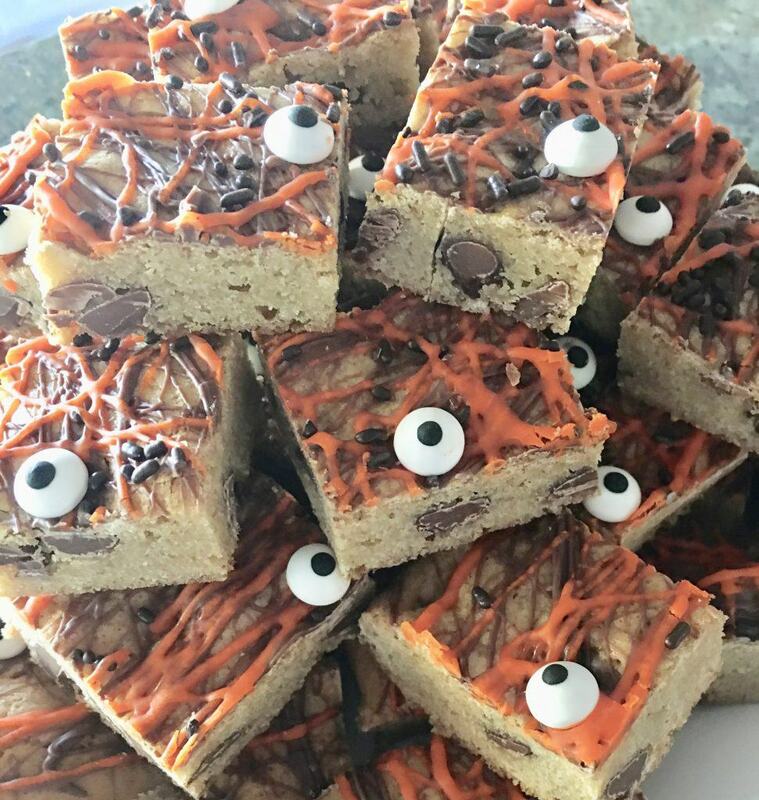 Give these easy Halloween Cookie Bars a try and let me know what you think in the comments! 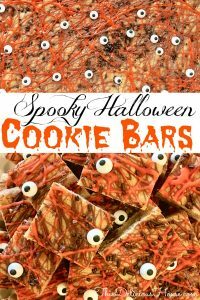 These spooky fun Halloween Cookie Bars are so easy to make! Swap out the toppings and serve year round for any occasion. In a large bowl microwave safe bowl, melt butter on high for about a minute. Mix in the brown sugar, eggs, and vanilla and stir to combine. Stir in the flour, baking powder, and salt until well combined. Fold in the chips. Pour the mixture into the pan using a rubber spatula to spread. Bake for 30-35 minutes, until toothpick inserted in middle comes out clean. (If the edges start to brown, cover the top of the pan with a loose piece of foil.) Cool in pan on a wire rack then transfer to refrigerator to cool completely before removing from pan. For the topping, microwave the chocolate chips on low heat until melted, stopping to stir every 30 seconds. 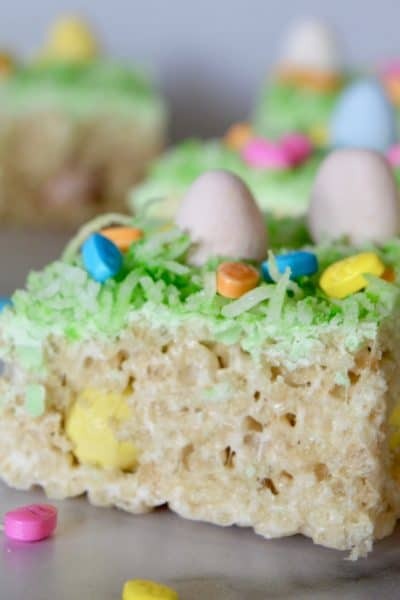 Drizzle melted chocolate and cookie frosting over top of blondie bars and decorate with candy eyes and sprinkles. 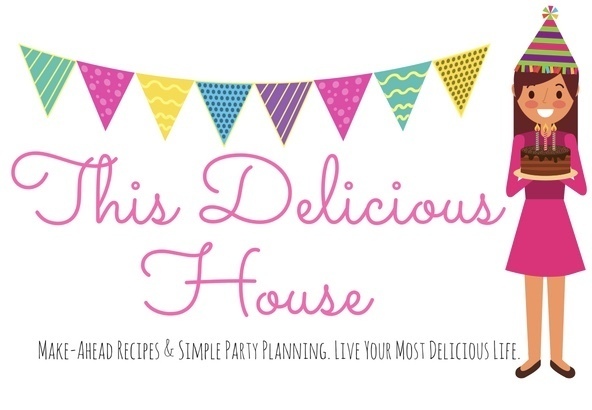 Because you love easy and delicious recipes, be sure to sign up for our weekly newsletter! « Crispy Nutella Truffles – Easy No Bake Recipe!